HomeConditions & Symptoms FAQWhat Causes Heartburn? Heartburn is a stinging or burning pain that usually centers around the heart, although it can be experienced anywhere between the stomach and throat. This discomfort is caused by acid reflux. 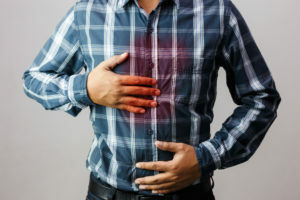 Acid reflux occurs when the lower esophageal sphincter (a ring of muscle that prevents stomach acid escaping from your stomach and up into your esophagus) becomes weakened or irritated. This can cause it to relax, allowing acid to flow up or ‘reflux’ into your esophagus. Because your esophagus isn’t designed to deal with this acidity, you experience pain and/or a stinging, burning sensation – heartburn.